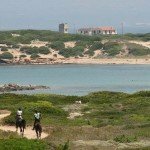 Discover Sardinia Island & what it has to offer! EARLY BIRD DISCOUNT 10% if you pay book and pay in full by 20th April 2019. 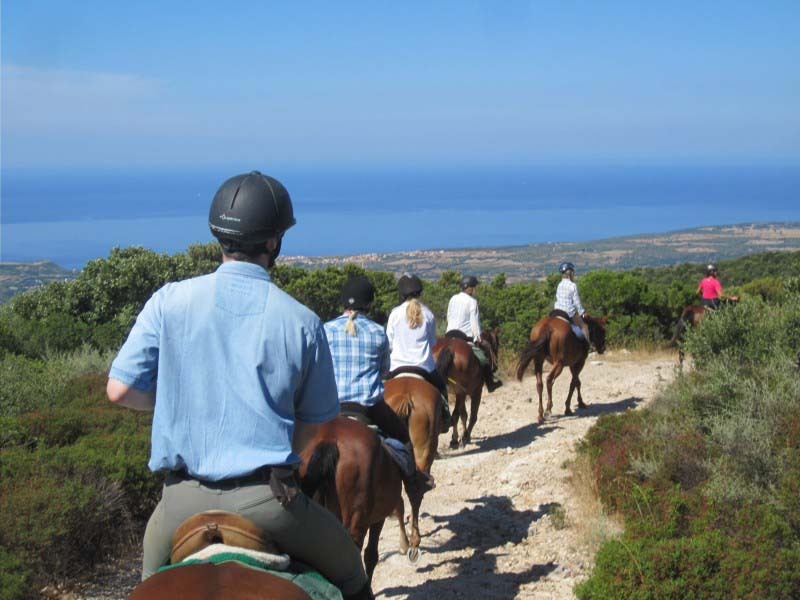 Suitable for riders & non -riders, a great place for a family holiday. Longer days riding out in the beautiful countryside, 6 – 8 hours per day. The price of each unit is € 19,00. Non-riders and children are very welcome, please enquire for reduced prices. Included – All riding, accommodation and half board except the Mountain & Sea Trail which is full board. Excluded – Flights, transfers, lunches, dinners, drinks and tips. There are 3 airports in Sardinia which you can fly to Alghero, Cagliari, and Olbia. For bigger groups a minibus can be hired (price on request). Taxis and transfers are expensive so we recommend that you hire a car. This gives you more flexibility to explore the area. Open from 19 April to 3 November 2019. 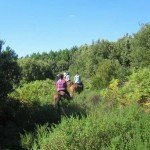 Sardinia Trails are based in at a peaceful country hotel, full of charm and character, which is set by the Monte Ferru mountains, surrounded by quiet countryside and woodlands and not far from an impressive coastline. 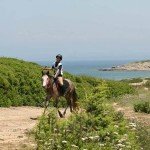 Here you can choose to either go out each day and follow beautiful riding trails through the mountains and down to the sea or you can engage in some training in dressage, show jumping & endurance or you can focus on your riding ability and work on your seat and your fitness levels. 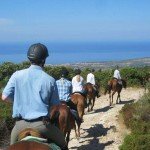 This is truly an equestrians dream holiday where you can partake in all sorts of equine activity as part of our Horse Riding Holiday in Italy collection. 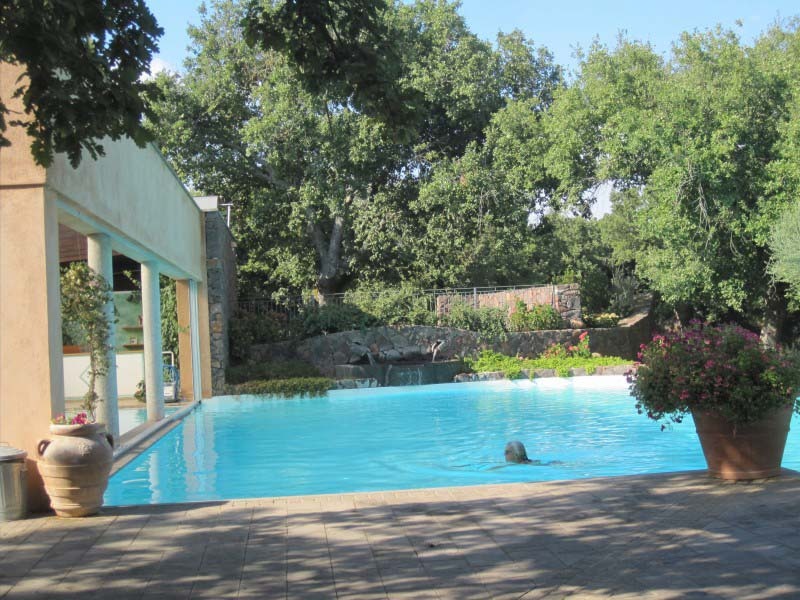 Most days you’ll ride each morning, depending on your programme, returning to enjoy afternoons at the poolside at the country house or venture out for some local sight seeing. Old oak and cork trees dot the lawns, providing shady spots where you can relax and listen to the numerous birds in the area. The swimming pool area is lovely and features a covered area and a spacious indoor jacuzzi – making it the perfect place to unwind after a great day in the saddle, before settling down to a 4 course evening meal either in the main dining room or outside on the terrace. 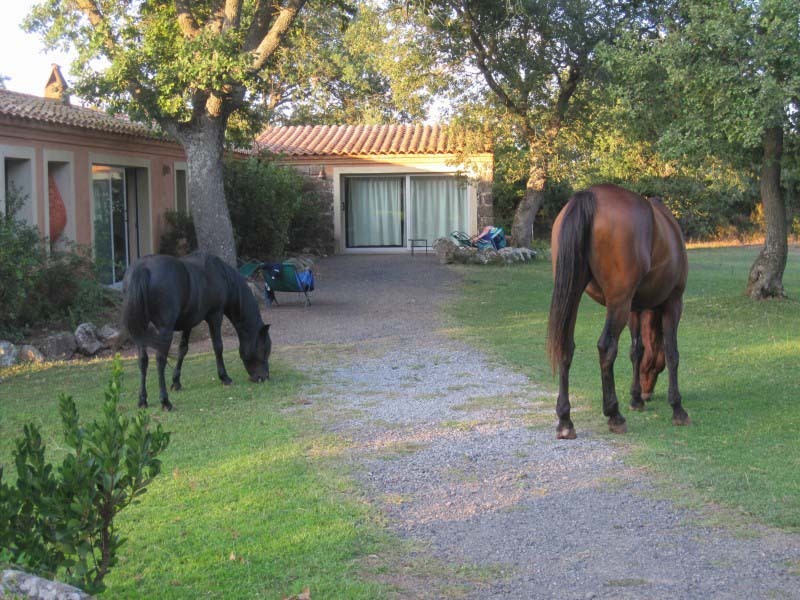 The hotel and stables at Sardinia Trails are family run by Daniele and his partner Paula. They both have a great passion for their horses and it is obvious in the way they are looked after. They are very happy in their work, ride out together well (very little argy bargy between the horses) and they have huge amounts of energy. 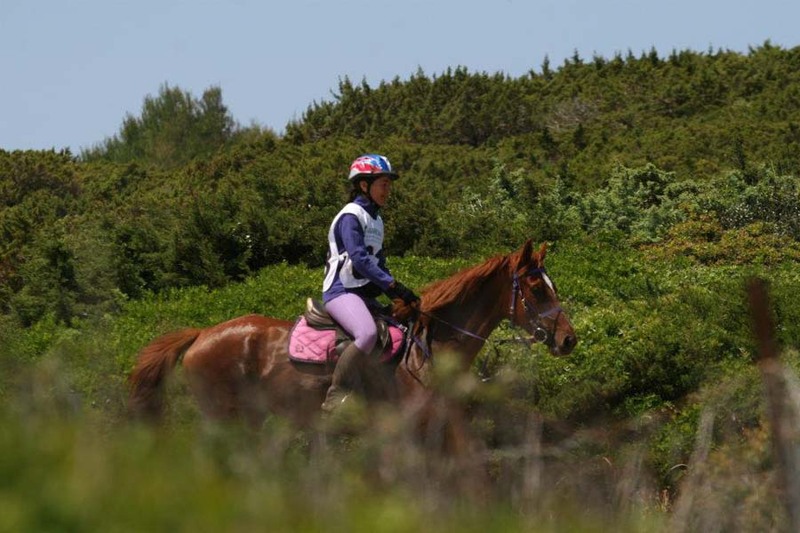 Their stamina is very impressive and is not surprising because Paula has a keen interest in endurance riding. Uniquely the horses are also allowed to roam the hotel grounds freely, which is very special and in the evenings, they are out together as a herd in their paddock. 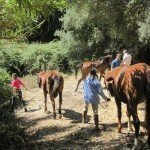 Daniele’s family have been breeding horses from here for hundreds of years, some of whom have enjoyed international show jumping careers, often returning to the farm to become schoolmasters or enjoy some trail work. 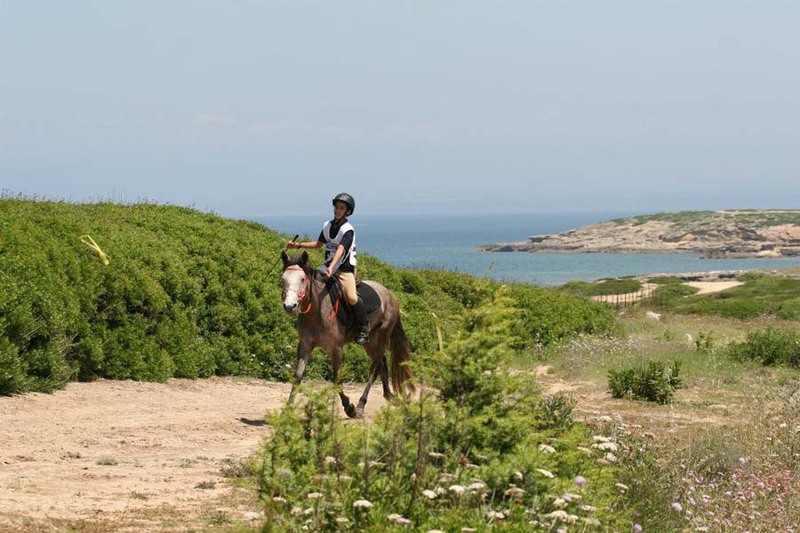 You will see lots of evidence of their success at Sardinia Trails, hanging on the walls of the house, which is interesting and brings alive the Sardinian love of horses and specifically Danieles families breeding passion. 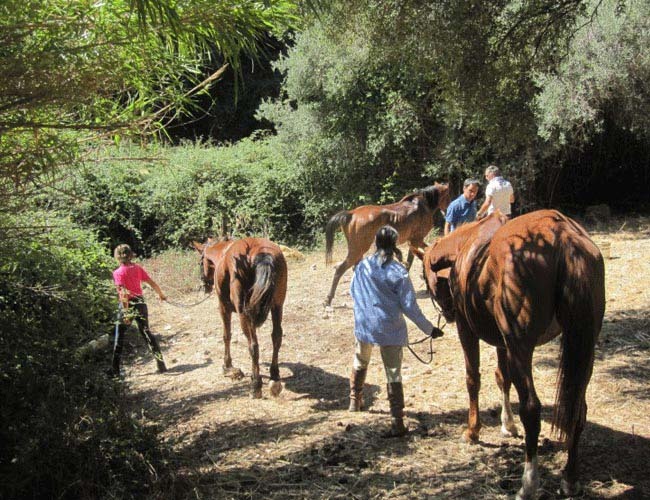 On Sardinia Trails non riders are also welcome making it the perfect Horse Riding Holiday in Italy if some of your group don’t want to spend the day in the saddle – it’s a beautiful setting and great place to relax during the day, read a book and chill by the pool, but equally, non-riders can meet up with riders for lunch time stops, take a bike and possibly ride back taking in the island. 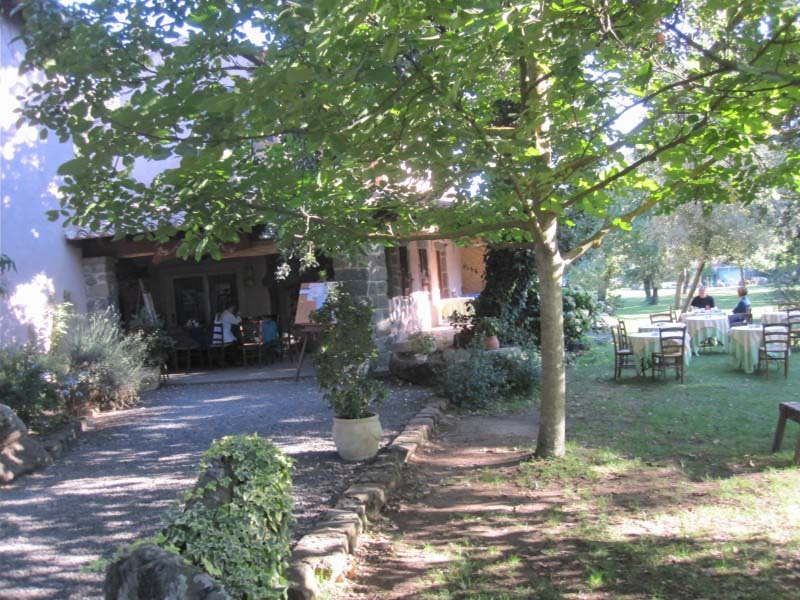 There’s also tennis and golf nearby, lovely villages and towns to explore and massages can also be arranged. 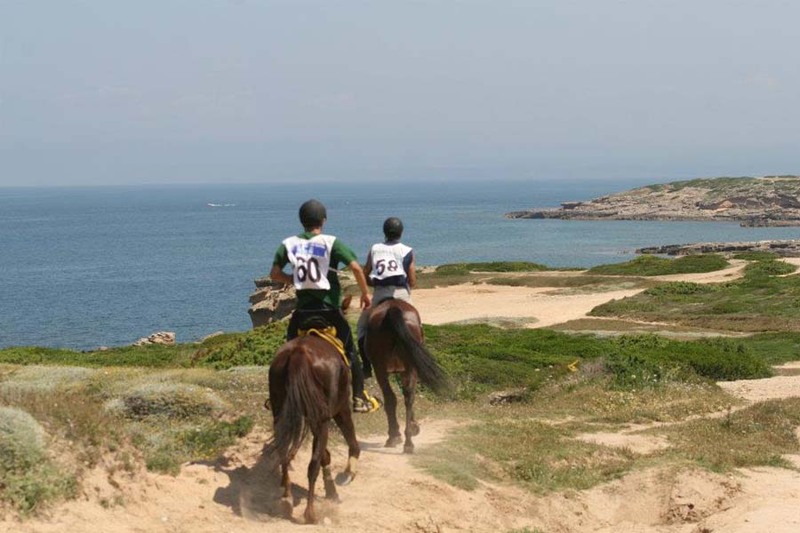 Sardinia Trails : Level of Riding & Pace – Intermediate to Advanced for the Mountains & Sea, Country & Beach Trail Rides. If other members of the family or other friends are beginners or novices, we can make up another programme for them and they can ride in the school and take lessons or book the occasional ride. 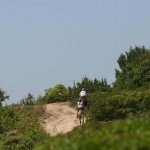 Sardinia Trails : Weight Restriction – 100 kg / 15 stone / 220 lbs. 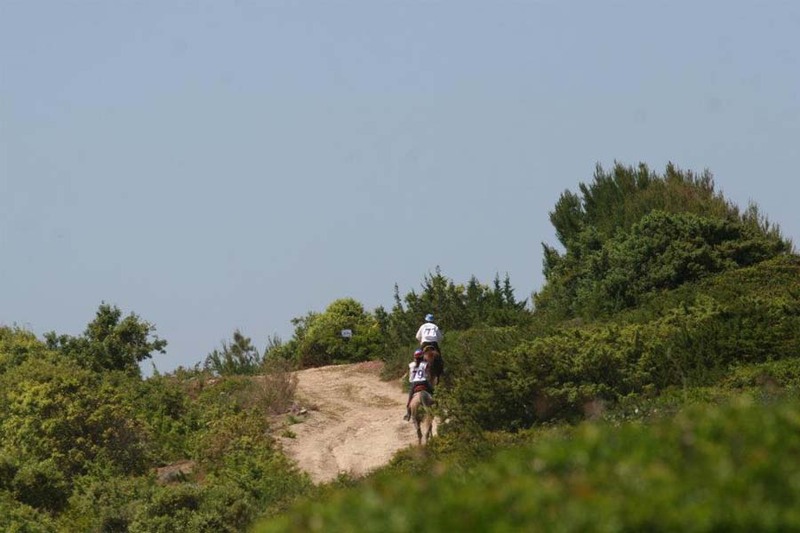 Sardinia Trails : Group Size – Maximum 8. 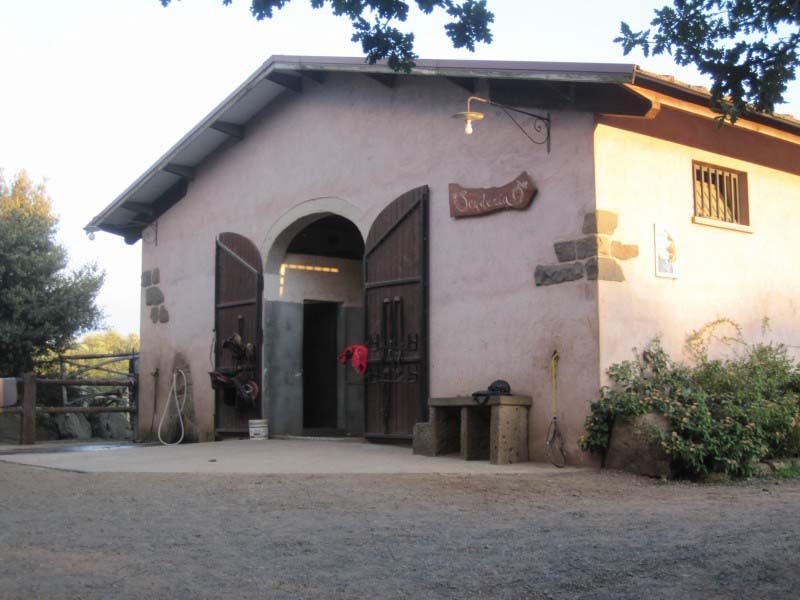 The accommodation at Sardinia Trails is very charming, well looked after, comfortable, clean and spacious. There are standard rooms, junior suites or garden suites, set within a beautiful garden where the horses graze freely during the day. 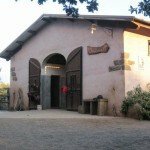 The area is extremely peaceful, surrounded by open countryside and decorated in authentic Sardinian style. There are eight suites and four bedrooms with shower rooms, telephone, ISDN line, satellite TV, air conditioning, hair dryer, safe and mini fridge (stocked with water, canned drinks and beers). Each room is decorated to a high standard, utilising local stone and materials. There are lots of thoughtful touches such as painted decoration on the walls. Standard rooms are within the main building and comprise of a bedroom and shower room. Junior suites are set in the garden with one bedroom and shower room and a small furnished patio area. The garden suites feature two rooms as well as the shower room and have deck chairs outside the door for you to relax in. The second room can be used for 2 additional beds making it good for friends want separate rooms, families or small groups. There’s also a wonderful swimming pool, part of which is indoors. There is a large jacuzzi indoors and a variety of sun loungers, both inside and out. The food at Sardinia Trails is authentic Sardinian style, which uses local and organic ingredients and served either in the dining room or outside on the terrace. Breakfasts are buffet-style and include coffee, a selection of different teas and a variety of juices. Ham, cheese, eggs and bread rolls are all available, as well as cereals, biscuits, pastries, honey, jam and fruit. Dinners are four courses and include a starter, a pasta course, a main course and then dessert. Guests can expect to be served a variety of meats and fish but special dietary requirements can be catered for with prior notice. The menu is printed and put up on a board outside the restaurant each afternoon and alternatives can be provided if there is something you really don’t like! 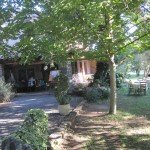 All guests stay on a B&B basis and can decide when day by day if you would like a lunch and dinner or alternatively eat out at the nearby Pizzeria or restaurants. There is a bar next to the reception from where you can get drinks at anytime. 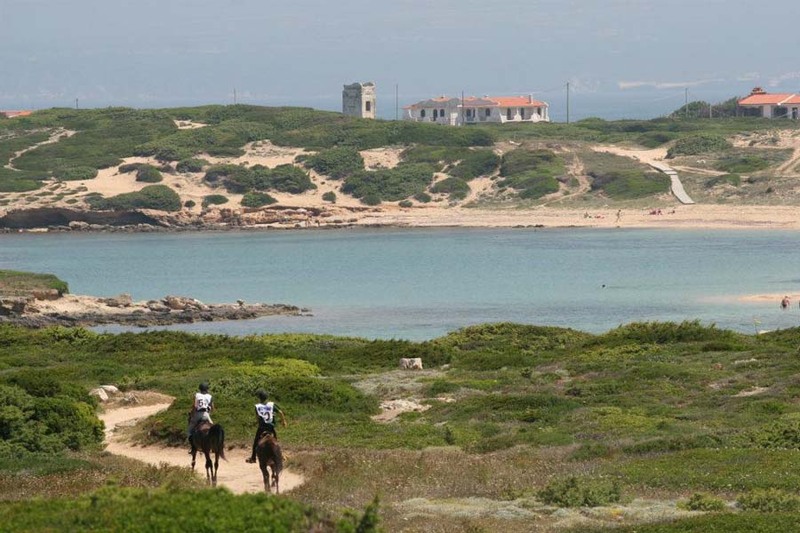 Horse Riding Holidays at Sardinia Trails are part of the Zara’s Planet collection of Horse Riding holidays Italy. 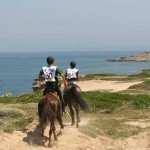 A seven night package at Sardinia Trails combining three days of riding from the country hotel with three days of riding at the beach. 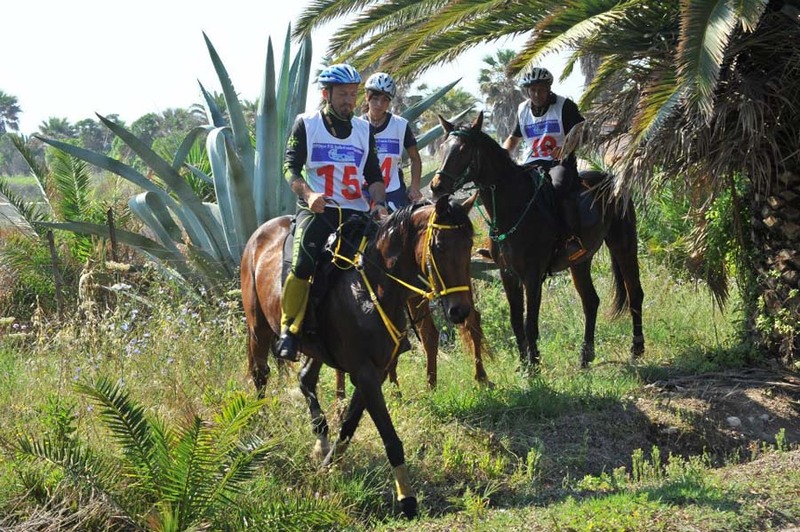 Riders will spend approximately 3 – 4 hours a day in the saddle, exploring the beautiful and varied Sardinian landscapes. This is the perfect combination of country and beach! The beach stables are a 35 minute drive from the hotel accommodation, you therefore must have your own hire car. 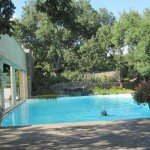 You return to the hotel each evening for dinner and accommodation. Arrival and check-in, then time for dinner. Meet the horses after breakfast. A horse will be selected for you according to your riding ability and after 10 - 15 minutes in the riding arena you will start your first ride out from the hotel grounds. You will pass over ancient shepherd paths which didn't change for the last 200 years. You will head along stone walls, which are typical for Sardinia, and behind them you will see animals such as sheep, donkeys and cows grazing peacefully. The landscapes are calm and peaceful. Today you will ride again from the main stables but in another direction. You will see an ancient graveyard called 'tomb dei giganti' which people think is 4000 years old with giants buried there! It still has a magical atmosphere. After this you will head into an oak tree forest where you can enjoy a long canter before turning back. It is a pleasure to see the little farmhouses with the farmers doing their daily work in the fruit and vegetable gardens. The horses are fresh and in good spirits when you fetch them from the big paddock. The riding today is on long, curved paths which allow for plenty of trots and canters. Sardinia is a volcanic island and so you will pass by regions of cold lava and stones. 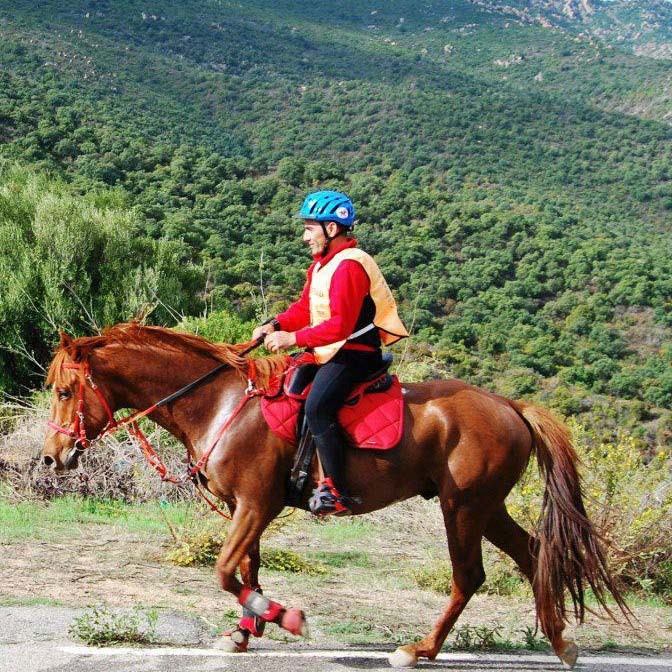 The horses are sure-footed, like mountain goats, and you will enjoy another 3 hours of riding in this peaceful area. Today is the first day of riding from the seaside stables which are about a 35 minute drive from the country hotel (transfer included if requested, otherwise you head there by hire car). Your guide at the beach will give you a short briefing before introducing you to your horse. The landscape will be totally different here as you are on the half island of Sinis. You will discover the stony cliffs of Capo Mannu. 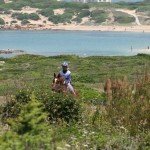 The views from your horse are breathtaking today - you can see cliffs over 200m high and the frothy waves of the sea water. The ride also passes a big salt lake and if you are lucky you might see the pink flamingos. 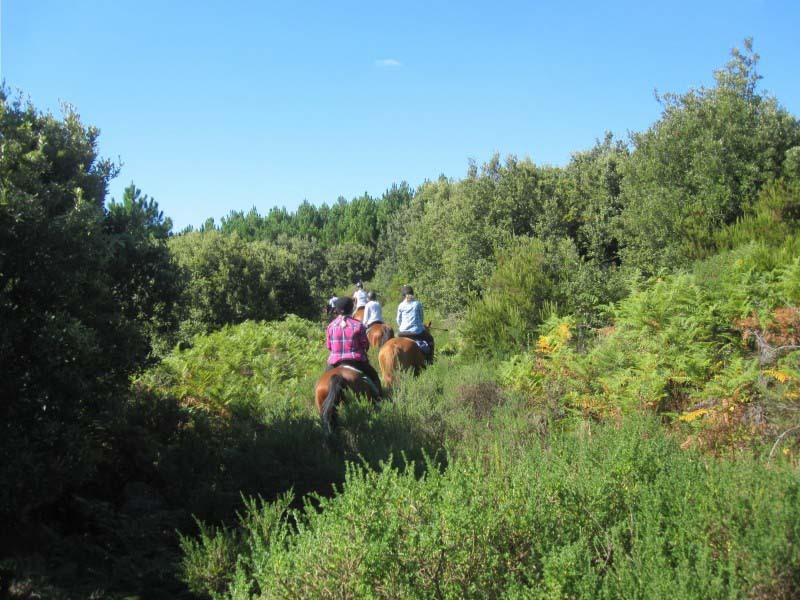 This ride takes you into the large pine wood of Is Arenas where you can enjoy riding up and down over the sandy ground, the pine trees reflecting the sun light and creating a wonderful scent. Eventually you will reach the 10km beach which is covered with soft sand. The horses enjoy playing in the water and find it refreshing to walk in the shallows. This is also an opportunity for a great canter/gallop! 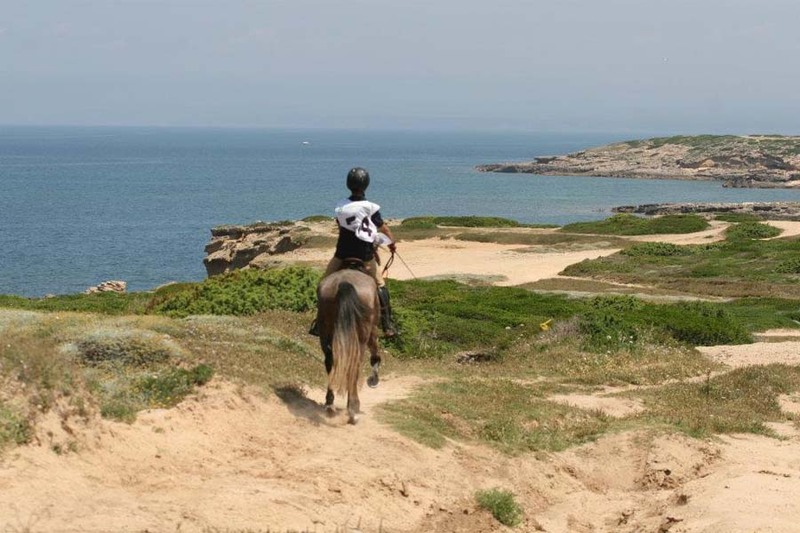 Today is your last riding day and you will head into the protected area of Sinis. Here you will pass pinewoods, canter over the field paths surrounded by meadows of flowers and will climb the high cliffs to see the fantastic views of the emerald water. Finally you will reach the famous 'rice corn beach' of Maimoni which is covered with glittering white quartz sand. Together with the intense blue sea water it provides a blaze of colour and a beautiful setting for your last ride of the holiday. Please note that above itinerary is subject to change if necessary and may in some cases be offered the other way around (riding from the beach stables for the first three days). In 6 days you will discover this island – different landscapes each day. 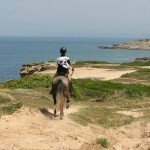 The ride starts at the stables, climbs the mountains of the Montiferru and finally arrives at the sea. The whole trail is about 150 km, and crosses areas that ordinary tourists never see. 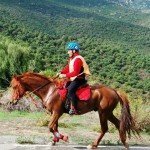 First day 2 -hour test ride to match the horses, 5 -day- trail about 3,5 hours per day. 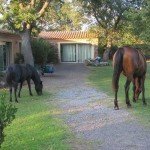 Picnic with the horses, mountain views & beach gallops, an unforgettable experience! 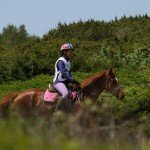 Feel free to choose and tailor-make your own riding program for all levels, from the very beginner to the experienced rider. 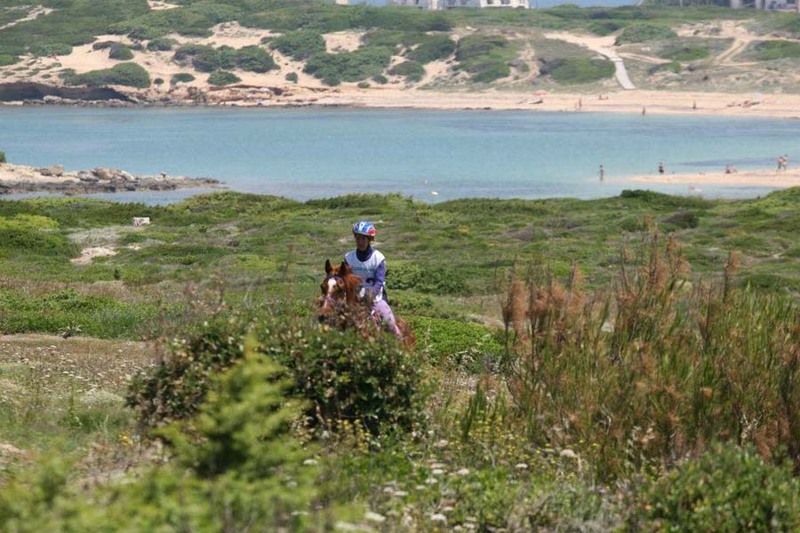 You can decide on site whether you have lessons or ride out in the countryside or at the sea. A week of focused training on each discipline, with the choice of having 1 or 2 lessons per day.